Welcoming HH Bhakti Swarupa Caitanya Swami! ~ The Toronto Hare Krishna Temple! Welcoming HH Bhakti Swarupa Caitanya Swami! 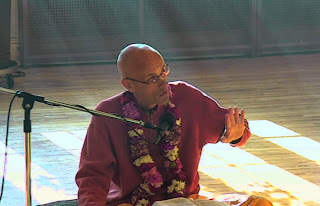 This week, Toronto's Hare Krishna community is excited to welcome HH Bhakti Swarupa Caitanya Swami! He will be conducting various programs around the GTA and will be conducting the Sunday Feast this upcoming Sunday, May 17th! HH Bhakti Swarupa Caitanya Swami joined ISKCON in 1979. From 1984-89, he printed and distributed Srila Prabhupada books underground in Russian language. He served as the temple president in the first temple in former USSR, Kaunas city. He also served as the regional secretary for Volga and west Siberia regions, in Russia. Since 1998, Maharaj has since visited Germany, Canada, the United States, Switzerland , South Africa and in Baltic states of Estonia, Latvia Lithuania. On February 21st, 2015, His Holiness Bhakti Caitanya Maharaja awarded sannyasa to Maharaj.